Stephen Usery interviews Nancy Pearl about her newest guide about what to read next with Book Lust to Go: Recommended Reading for Travelers, Vagabonds, and Dreamers. Not a listing of guide books, Book Lust to Go looks at travel memoirs, novels that evoke a strong sense of place, epic histories, and mysteries that get to the nitty-gritty of some of the world's most fascinating places. 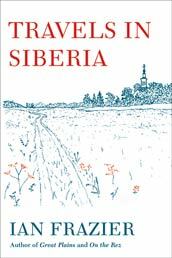 Stephen Usery interviews Ian Frazier about his new book Travels in Siberia, which details several trips to this vast land after the fall of communism. Frazier is a writer and columnist for the New Yorker who is known for his keen wit, as well as his serious non-fiction works like On the Rez and Great Plains. Stephen Usery interviews Lee Sandlin about his book Wicked River: The Mississippi When It Last Ran Wild. It's an interesting and sometimes funny look at the Big Muddy between the Louisiana purchase and the end of the Civil War, including close looks at crime on the river, the New Madrid earthquakes, and the Sultana riverboat disaster.